Goblin Barrel is the best update in the latest patch of July 2016. They reduced the cost of the Goblin Barrel from 4 to 3 elixirs. In the process, they removed the small initial damage of the barrel and reverted back the spawn time from the original. Because of this, many players will enjoy using the Goblin Barrel in all levels of the Arena. Goblin Barrel is a spell card that throws a barrel with 3 Goblins inside. They can deploy it any place in the map, just like the legendary card, Miner. It can be used as a surprise attack, split pushing or a distraction. Goblin Barrel plays well with a tank like Giants and Golem. 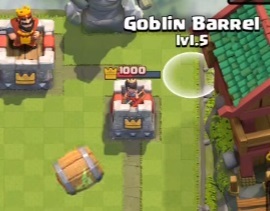 Once the Crown Tower starts attacking the tank, you can deploy the Goblin Barrel in the tower and take down it down fast. The common counter to the Goblin Barrel is using spells. 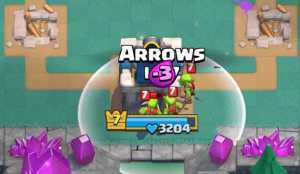 Arrows and Zap is the common counter to the Goblin Barrel. Before, because of the 4 elixir cost, you easily lose the elixir trade if the enemy used these spells. But because of the July patch update, you can now get a better trade with the reduced elixir. Countering the Goblin Barrel is now less punishing compared before. 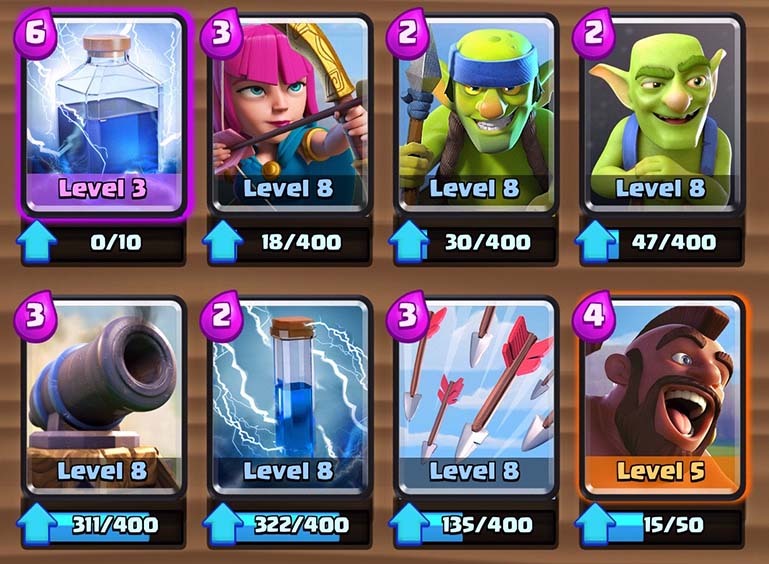 Building a deck with the Goblin Barrel is quite easy. It is a flexible card to begin with and can effortlessly fit in any deck you want. 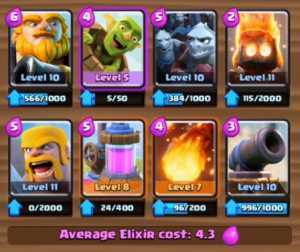 As long as you have cards to defend against your opponent’s combination and strategy, you can experiment and try different deck with your Goblin Barrel. 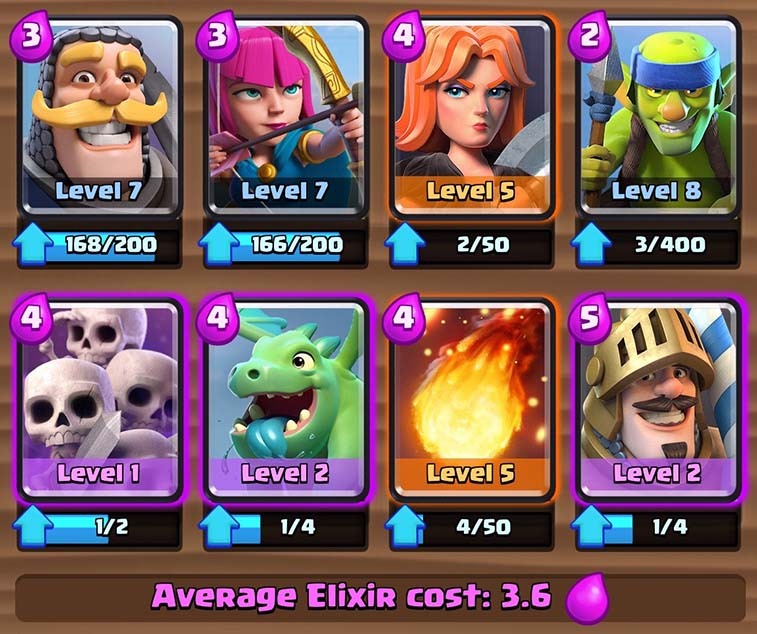 To help you get an idea of your preferred deck, here are some of the Goblin Barrel Decks that you can use as inspiration. This deck is really fun to play. You have Hog Rider and Barbarians to act as your tank cards. Hog Rider, as we all know, is a strong tanky troop that can tear down Crown Towers easily if not countered well. It can serve as a distraction, too, for Minions and Princess. 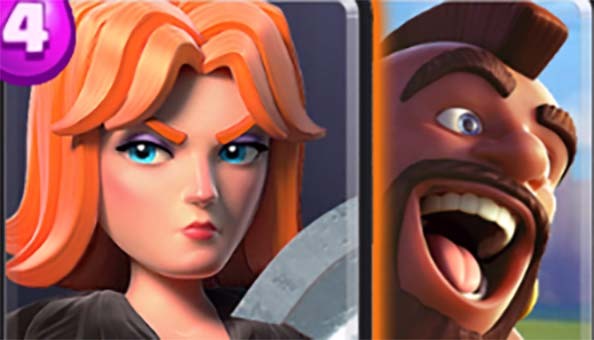 Barbarians will be your defensive killer against beefy tanks like Golem, Giants and Royal Giant. Because of their high health and good damage, they are flexible for offense and defense. Spear Goblins for distractions and support against flying troops. Your Zap will be used to counter swarm troops, stun your enemy for a small delay for additional damage and can be used to reset an attack especially for Royal Giants. Fireball is a great card to counter swarm of troops that is pushing to your lane. It can be used offensively by destroying Barbarians, Buildings, Witch, Musketeer, and get a better trade if you can target the tower at the same time. Inferno Tower will be your only building in this deck. You can counter tanks and building aggressive troops and can stay strong because of its decent health. You can use Spear Goblins as your first card to use. Either your enemy will use a card to defend his tower or let your Spear Goblins deal small damage before dying. Watch out for his cards to see if he has a Cannon, Zap or Arrows Spell. It is important to know if your opponent has them because they will be your primary counter to your deck. If the enemy doesn’t want to attack first and you get the full elixir count, you can use your Hog Rider. If he placed a building, don’t force to attack. If he doesn’t have a building, you can follow up with a Goblin Barrel or Spear Goblins. If your opponent used Zap/Arrows to counter the Goblin Barrel, always bear that in mind so that you won’t waste your Goblin Barrel card. Fireball can be used if the enemy has an Elixir Collector near the Tower or they have other buildings near it. You’ll have a better trade with that. You can use either Barbarians or Minion Horde as a defensive card against your opponents. The trick in using the Minion Horde is that your enemy will be forced to use Arrows. If so, you can throw your Goblin Barrel safe against the enemy spells to destroy your opponent’s tower. Miner and Goblin Barrel is a ridiculously fun combination. Both of them can get to any place of the map, fast. 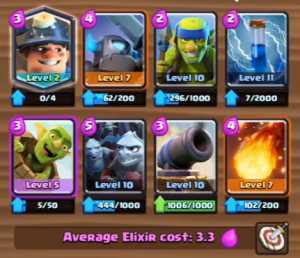 They can be used to distract opponents or immediately destroy buildings, especially spawner buildings and elixir collector, and towers. Mini Pekka is an offensive card that deals a lot of damage. Once it reaches the enemy tower, it will slice a chunk of hit points with its sword. Spear Goblins, again for distraction and supportive troop. Zap, a handy spell that can be used in many situations. Minion Horde will be your main defensive card against tanks. Cannon will be your sole building against Hog Riders, Royal Giants and other building aggressive troop. And Fireball for offensive and defensive play. You can easily use the Miner and Goblin Barrel combo early if you got lucky to have them both as your first cards. Because of their cheap cost of 6, they can reach your enemy towers fast. It’s a bit of a gamble and remember to deploy your Miner, first before the Goblin Barrel so that the Miner will serve as a tank, taking damage from the Towers. If you can do this first, watch your enemy’s cards for potential counters. If you don’t have a combination yet, use Spear Goblins for cheap damage. Use your Cannons and Minion Horde for defense. If your Minion Horde survives, immediately use the Miner so that the Minion Horde will survive long enough to destroy the enemy tower. If faced with a tank with a Wizard or a Princess, the Miner can easily get to them and distract them while your Minion Horde kills the tank. Use your Mini Pekka if you know you’re free from an enemy swarm troop. You can also use the Mini Pekka as a combo to either of the 4 cards. Mini Pekka with the Miner as the tank. Mini Pekka as the tank with Goblin Barrel. And Mini Pekka with the Minion Horde. Use your spells properly. Make sure that you’re going to hit most of the targets when you use Zap and Fireball. Lava Hound is a strong tank that is hard to counter if your enemy doesn’t have proper cards to use against it. Always watch out for Inferno Tower and Minion Horde as they can easily destroy this card. Goblins can be replaced with Spear Goblins as they both can serve as a distraction and support to your deck. A Musketeer is a ranged offensive card that works well with the Lava Hound. Valkyrie will be your main defensive card especially against swarm troops and can tank well, too. Cannon for Hog Riders and Royal Giants. And spell cards, Zap and Fireball. If you got Lava Hound immediately, you can start deploying your Lava Hound behind your tower. But be careful in using the Lava Hound. If you’re opponent has an aggressive first hand cards usually like Hog Rider and Miner, you’re going to be defenseless because of the lack of elixir. So it’s better if you will wait for your elixir to 10 (full) and make sure you have a Cannon or Goblins to use for unwanted attack from your opponent. 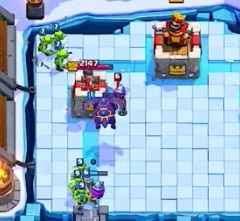 If your Lava Hound successfully reaches the enemy tower without hard counter, it is now easier to follow up with a Goblin Barrel and Musketeer. If your opponent decides to push with a tank like Giant, use your Cannon and place it near the center to distract the Giant. Wait until the supportive troop (Wizard/Witch/Musketeer), behind the Giant, crosses the bridge so you can deploy your Valkyrie to counter them. If there’s a mix of flying troops, you can use Fireball, instead. If he uses Arrows spell to your Goblin Barrel, he won’t have an Arrows spell to use it for the Lava Pups. If he has bot Zap and Arrows spell, try dodging the Zap spell by placing the Goblin Barrel on the side. 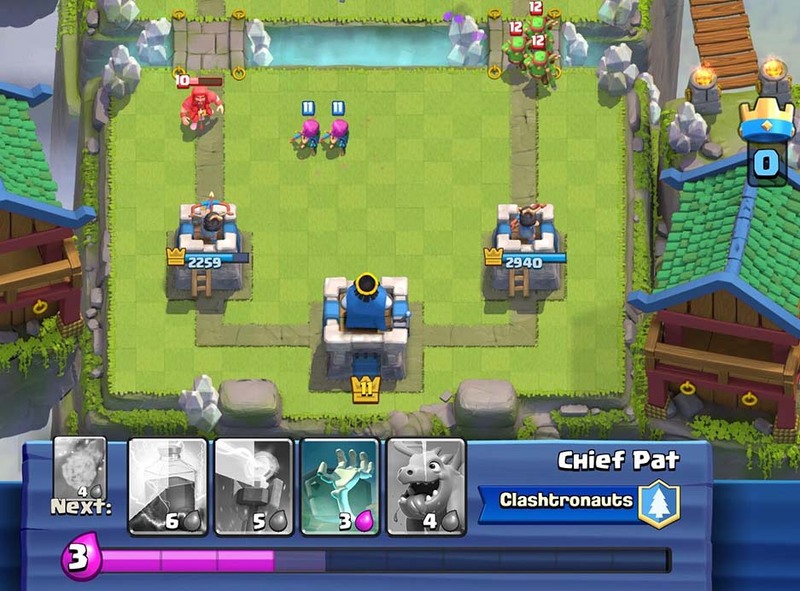 If he doesn’t have these spells, it is best to place the Goblin Barrel in the center of the tower so that each Goblin will be on the 3 sides, making it harder for splash damaging troops to kill them instantly. As long as your enemy doesn’t have a good counter to your Lava Hound, it will be easy for you to win the match. The Royal Giant is one of the most used card in Royal Arena and higher. Because of its long range and high hit points, it can easily destroy Towers while tanking the enemy towers and troops. You can add Goblin Barrel and confuse your opponents which one to take down first, the Royal Giant or Goblin Barrel. Minion Horde and Barbarians will be your defensive troop against pushes. Again, Minion Horde can bait your opponent to use Arrows/Zap spell which will give you the opportunity to place your Goblin Barrel in the opponent’s tower. 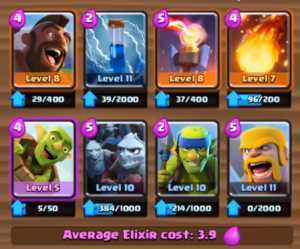 Fire Spirits is used in combination with the Royal Giant. It can easily kill swarm troops that is the usual counter to Royal Giants. Cannon will be your only building against Hog Rider and Royal Giant. Fireball will be your supportive spell against pushes and opponent’s buildings. If you have an Elixir Collector in the first hand, it is the first card to use, unless your opponent immediately spend his elixir to get full offense. It is ideal to put the Elixir Collector behind the Crown tower or in the center. Then wait until your opponent attack. If your opponent attacks, prepare to counter it. But in case that you don’t get an Elixir Collector in your first hand, you can deploy the Royal Giant in two places. (1) If you have a good set of first hand cards, wait until full elixir and immediately place the Royal Giant near the river. Then use your Goblin Barrel and Fire Spirits in conjunction. Your opponent will not expect an immediate attack and can deal a lot of damage to them without proper counters. 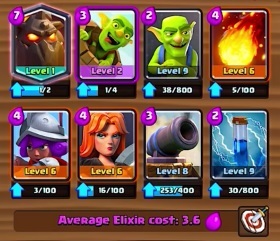 (2) If your card lack either the Goblin Barrel and Fire Spirits as your combination, you can deploy your Royal Giant behind the Crown Tower so you’ll going to wait until you get the right cards and enough elixir to get a full push. 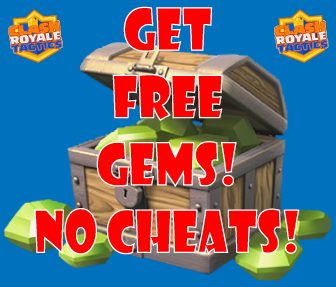 However, because of this, your opponent will have enough time to plan ahead to counter the Royal Giant. Minion Horde and Barbarians should only be used for defensive attacks. If they survive from the push, you can use your Goblin Barrels for follow up damage. Once you’ve destroyed one tower, it’s already a win on your side. Royal Giant is known for it’s strength after destroying one Tower. 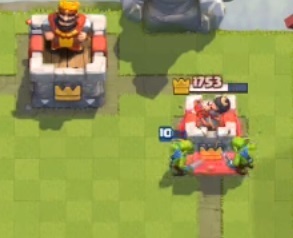 You can place the Royal Giant in the center of your opponent’s map and target the Tower easily, without taking damage from the King’s Tower. Just do the combination as mentioned above (Goblin Barrel and Fire Spirits) and you’ll win the battle. • A high level Goblin Barrel (Level 5) will have enough hit points to deal much damage against solo Crown Towers. The Goblins will take 3 hits before getting killed by the tower, compared to the usual 2. It ultimately that give the Goblins more time to deal damage to the tower! • Use a bit of mind game in deploying your Goblin Barrel. Use it first directly at the Crown Tower so that the three Goblins will be separated in three different directions. Making it hard for troops to swipe it by a single shot compared to deploying it on an area where the three Goblins are near each other. If your opponent has Zap or Arrows, they will use it immediately to defend its tower. So the second you try to place your Goblin Barrel, try to place it near back or the side of the wall to evade the predicted spells.